The Tennessee Titans sacked the New England Patriots quarterback Tom Brady three times on Sunday. Yes, three times. They kept the pressure on Brady throughout the game, and Brady looked mighty uncomfortable out there. So much so, he was pulled in the fourth quarter and replaced with backup QB Brian Hoyer. Now, who would have imagined such things would be happening this past Sunday at Nissan Stadium in Nashville? Not many. Tennessee got off to a quick start with wide receiver Darius Jennings running for 58 yards with the kick off return, and the Titans were fired up! The energy from this opening play was enough to keep the team on top for the entire game. By the end of the first quarter, the score was 17-3. Tennessee never trailed the Patriots, not once. WR Corey Davis had a great game with seven catches and one touchdown. Patriots cornerback Stephon Gilmore was matched with Davis but was getting beat every play. Gilmore was grabbing at Davis (and holding, eh hem, refs!) and Davis was able to still have a great game. Unsung play of the game. Running back Derrick Henry had two touchdowns, with a season high of 58 yards on 11 carries. Various news outlets had rumored that the Titans had shopped Derrick Henry before the trade deadline earlier in November, but did they not find any teams that garnered enough interest. Thank the God of your own understanding that there were NOT any takers. Titans quarterback Marcus Mariota was stellar and just about perfection against the Patriots. A healthy Mariota is a play making Mariota; if he can stay uninjured the team should make it to the playoffs. The Titans defense was relentless less for all four quarters, keeping the Patriots offense and Tom Brady uncomfortable. In other words, the defense stuck to the game plan and it worked. The Titans have a sweet upset victory, 34-10, over the AFC East top ranked NE Patriots and the team is now only trailing behind the Houston Texans (6-3) in the AFC South. Tennessee with travel next Sunday to Indianapolis to play against the resurging Colts, who have won their past three games. The Titans need to stay focused and not get too cocky. They need to win this divisional game and keep the ball rolling. 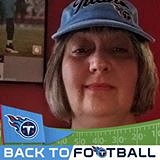 Posted on November 13, 2018 November 13, 2018 by Karen ChristensenPosted in AFC East, AFC South, New England Patriots, Tennessee TitansTagged Brian Hoyer, Corey Davis, Darius Jennings, Derrick Henry, Karen Christensen.